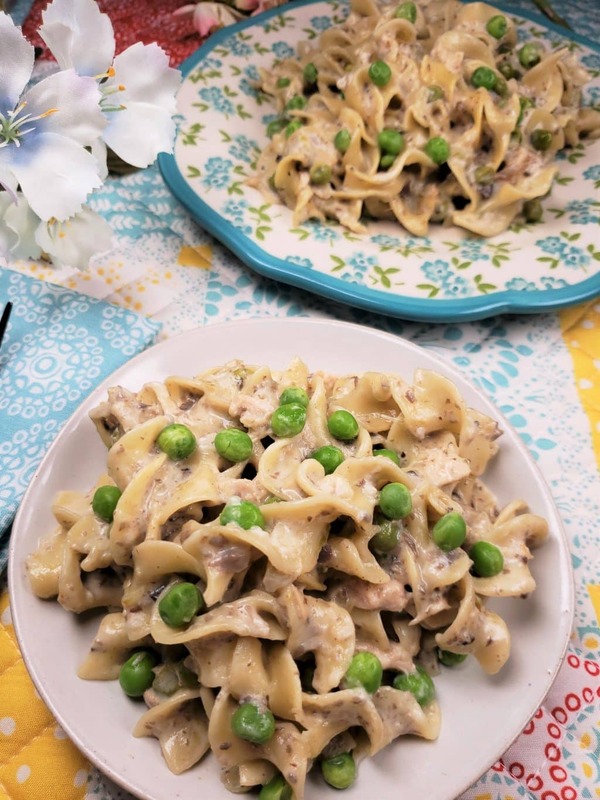 My Pressure Cooker Tuna Noodle Casserole is pure comfort food. Fresh cream, mushrooms, celery adds layers of flavor and will bring you back childhood memories. A popular casserole dish that gained attention in the 1950’s. Busy moms could easily throw together a meal and have dinner on the table in no time. Using the Instant Pot or Pressure Cooker makes this homey and comforting favorite dish, so ridiculously easy. 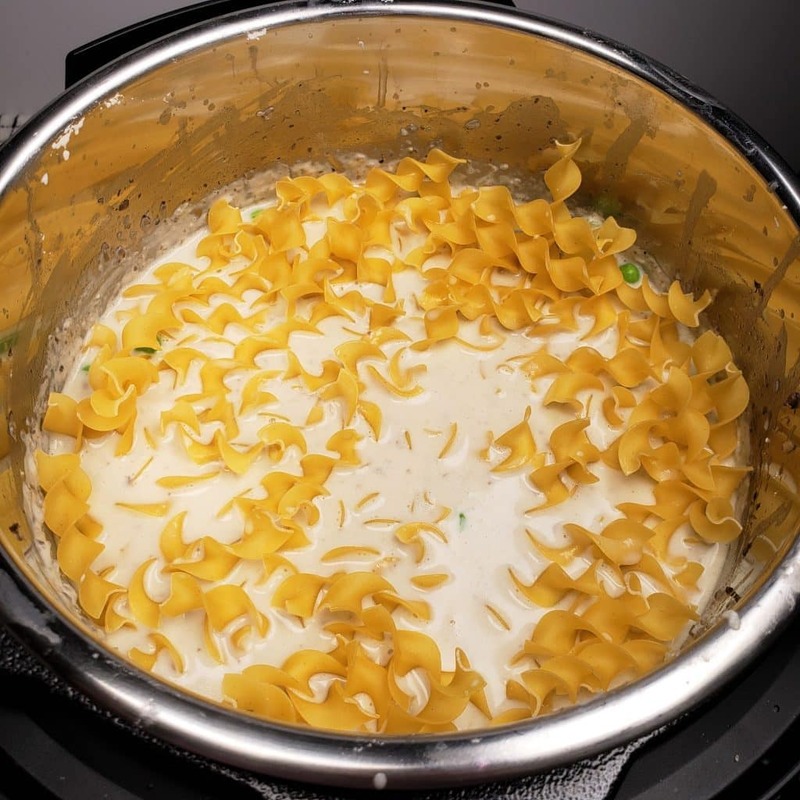 With just one pot to dirty, working moms, dads, students and even teens can get dinner on the table in under 15 minutes. You won’t find cans of condensed cream of soup in my easy to make recipe. Instead, we will use fresh Cremini mushrooms, onions, celery, butter and cream! While I know that it takes very little time to just dump in all the ingredients and push start, I just can’t get myself to write the recipe as a total dump recipe. I refuse to sacrifice incredible taste for only a few minutes more. I promise, this is simple and the extra 10 minutes it takes to make homemade cream of mushroom and cream of celery soup is so worth it. 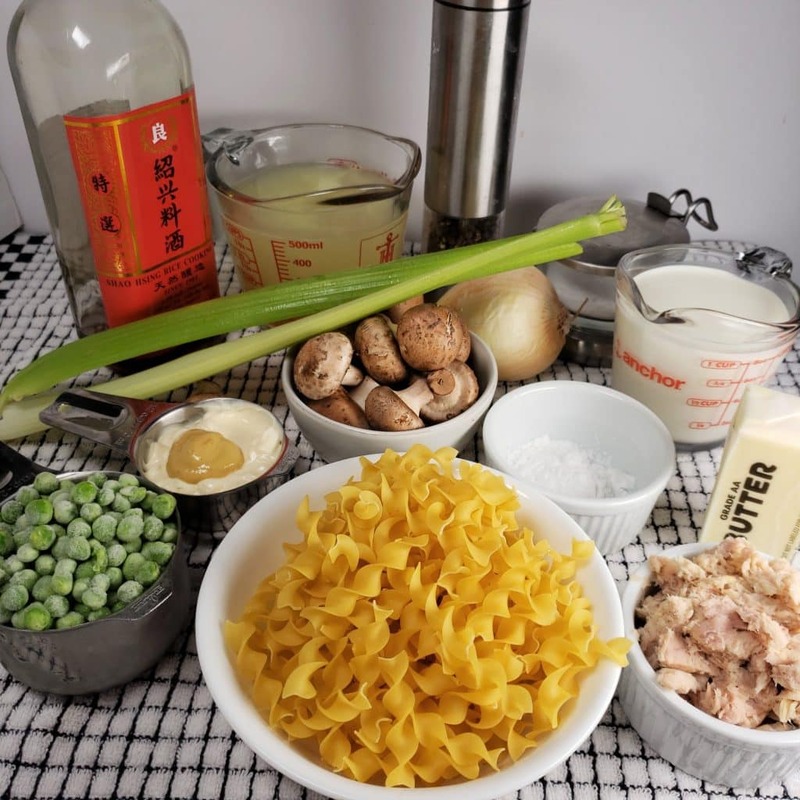 What Ingredients are in Tuna Noodle Casserole? I’m joking about that secret ingredient, as I haven’t made this recipe in a very long while. Ed won’t even give Tuna Noodle Casserole a try, so it’s been years since I made the recipe. As a result, I created this incredible Instant Pot Dijon Shrimp Linguine, which Ed loves, as does everyone who has made my recipe. And I forgot to add it when I was cooking it for the blog. Most of that time is pretty hands off and while the shrooms, onions and celery are sweating, you can gather the rest of the ingredients. So if you look at it that way, maybe just two minutes longer for a result that is 100 times better! Warning – Graphic content follows. Making homemade condensed cream of mushroom and celery soup from scratch, is not a pretty picture. It is so totally worth it though and I will let YOU be the judge…. Grab your Food Processor and let’s get started. If you have a good food processor, you can reduce your prep time by quite a bit. Just drop the ingredients into the food processor and give it a whiz. How long would it have taken you to chop all that? 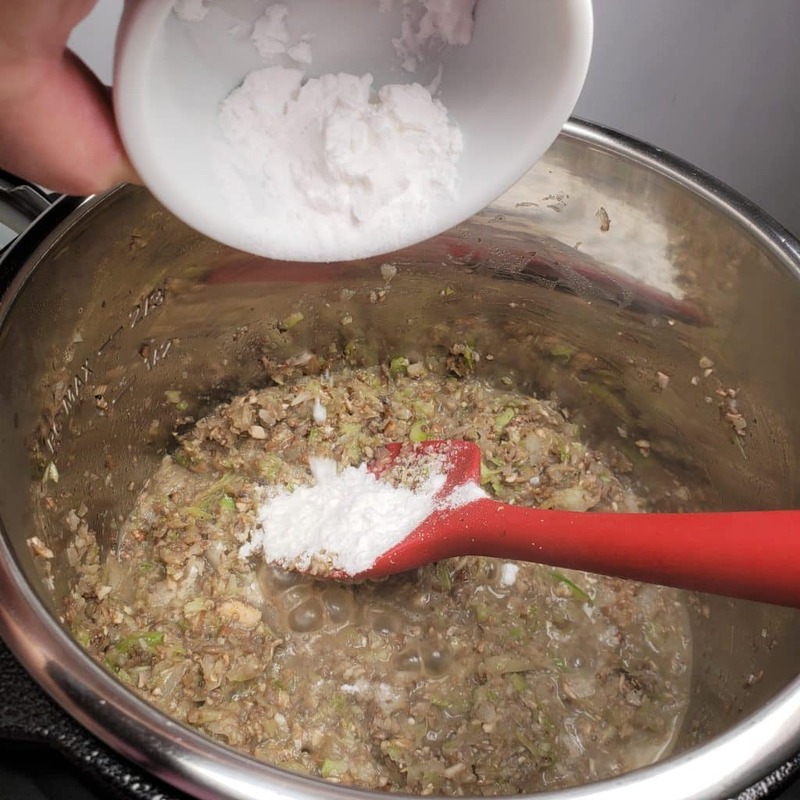 I use my food processor in so many recipes, like my Pressure Cooker Salisbury Steak w/Onion Mushroom Gravy, Pressure Cooker Greek Meatballs, Pressure Cooker Low Carb Hot Onion Dip, Pressure Cooker Cauliflower Soufflé and so much more. I cut the recipe in half and used my Cute Little Mini Instant Pot. This recipe is easily doubled in a larger Instant Pot or Pressure Cooker. As I played around with the ingredients and methods for this particular recipe (my hubs won’t touch anything with hot tuna), I didn’t want to make a large batch cause it’s only me eating. Some people leave the mushrooms in slices and I did that too, but found I enjoyed this dish by first making a proper condensed mushroom soup, with bits of fresh mushrooms. It is the way I’ve done it on the stove for years, but I was trying to do a quicker method for people who love quick, but delicious tasting food. So I made first made a batch with sliced mushrooms and homemade condensed cream of celery soup. Nope, while it was delicious, it just wasn’t up to my standard of deliciousness for this homey recipe. The mushrooms stood out on their own too much because of the texture and while really good, it lacked the homeyness from the good old days. 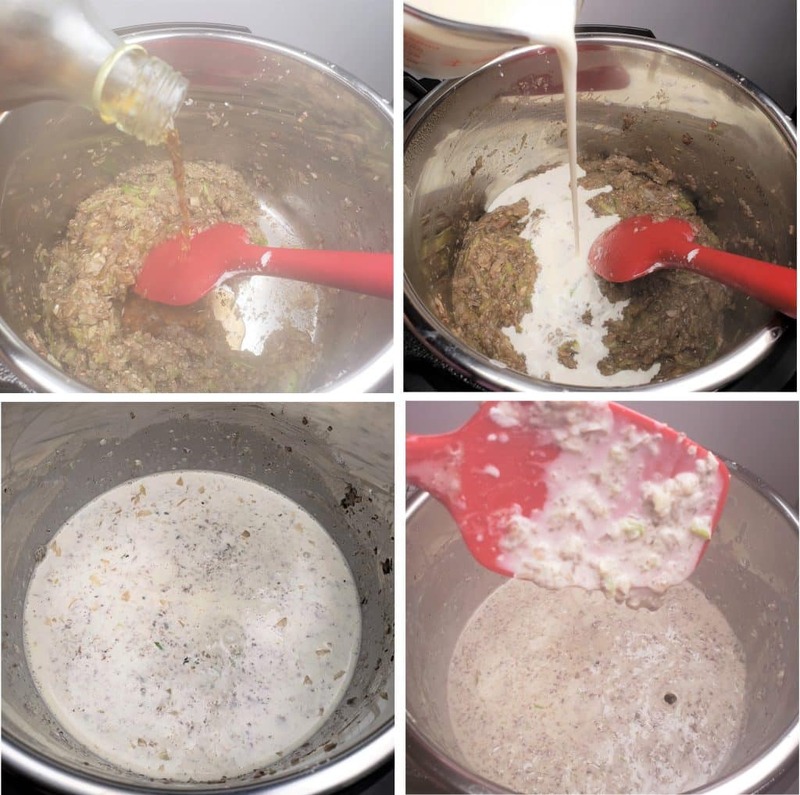 The mixture looks like mush, but, what did you think it a condensed soup looks like? Potato Starch gives this Pressure Cooker Tuna Noodle Casserole recipe a lighter taste than using all purpose flour. If you can’t find potato starch in the store, click this Potato Starch link and get some. I use it in place of flour so often. It’s lighter, works better in the Pressure Cooker and if you check my Air Fryer recipes you will see that I use it all the time. It’s also super cheap. Plus, it is Gluten Free!!!! Yay. How do you Make Condensed Cream of Mushroom Soup? Grind up mushrooms and onions. Sweat them down over medium heat. Add butter, cream and seasonings and reduce until thick. How do you Make Condensed Cream of Celery Soup? 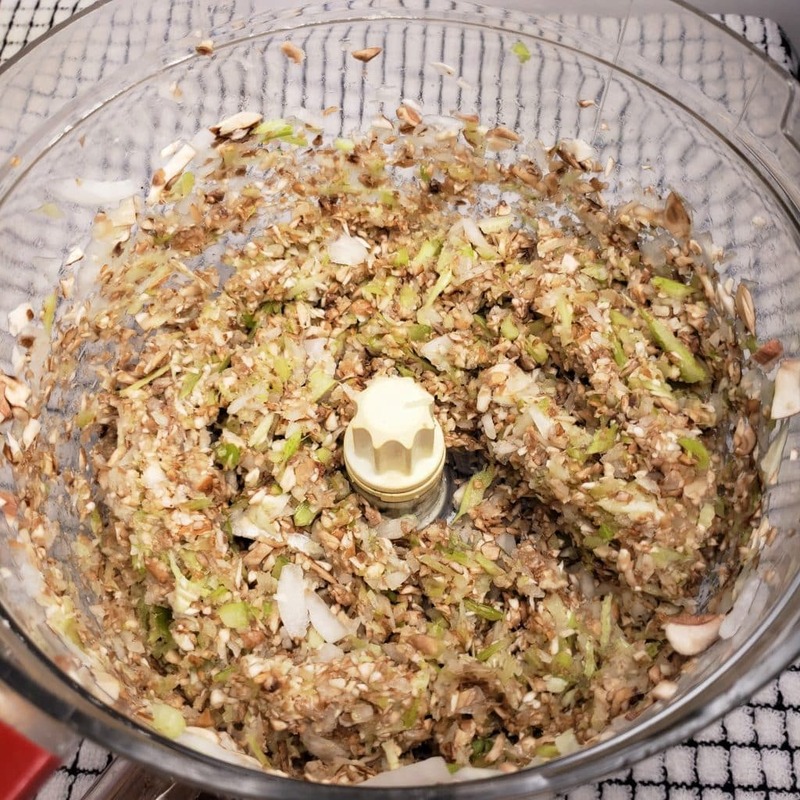 Grind up celery and onions. Way back when, people used either a can of condensed cream of mushroom soup or a can of condensed cream of celery soup. Rather than skimping on flavor, I always opt to make both at the same time; it’s just as easy. This is one of the beauties of Homemade Condensed Cream of Anything Soup. You can make as much or as little as you like and no non-pronounceable ingredients and no half cans to get old and nasty. If you have been following my ThisOldGal.com blog, you know I always take flavors to soaring levels. You know that I frequently saute mushrooms and onions with Dry Sherry or Chinese Shaoxing Wine. Remember my incredible Pressure Cooker Beef Stroganoff recipe? I’ve received record number of emails about that recipe. I didn’t stop with this old fashioned recipe. When I made this recipe the other day, I totally forget to add the Mayo AND the Dijon mustard and then, to throw flame to the fire, I added cheese instead. I mean, it tasted good, but not like I had remembered. The next day, I gave it another taste and added mayo and it was better, but still not perfect. I again slept on it, or started to sleep on it, when I was reminded that I still had my old Turbo Cooker, which I used to cook with a lot. I was in the hospital for a few days and the Turbo Cooker was on all the time. I bought it. I used it. I LOVED it. So much in fact, the company phoned me and asked me to do an infomercial for their next product, the Turbo Grill. I agreed and they sent me the Grill. I wasn’t in love with it, but I had already committed to the commercial. Well, you know me, I cannot lie and I did state the good points, as there are some, but was I in love with the product, no. This was in 2002 and I was a member of the Turbo Cooking group on Yahoo. I actually think it still exists as every once in awhile, I get an email with updates about the group. There is a very basic recipe that came with the cooker, sooooo, I got out of bed, found the cards and, bingo, it all came back to me. Their basic recipe did not include cheese, so I knew, the addition of cheese was the issue. My yummy recipe ingredients came back to me. Anyway, I digress, that is what was giving the recipe an unusual taste. What the heck was I thinking? I have no idea why the heck I grabbed a brick of cheese, as while many of you think that everything is better with cheese, a tuna noodle casserole, really isn’t. I mean, I get it, my husband thinks you can never have too much cheese. At this point, you will want to taste and add more salt and freshly ground black pepper if needed. You’ll want the sauce to be slight more seasoned than perfect for your taste, as the egg noodles still need to be added. Use my Homemade Chicken Broth, if you have some available (add 1/4 cup extra water if you do), or mix up a little Better than Bouillon with water. Or just use plain water. Adding peas prior to cooking, saves a tad bit of time. I tried it both ways to see which I felt was better for my personal tastes and preference. While this dish was excellent with the peas pressure cooked, I prefer the harder snap of the pea. Some people prefer a softer pea. Check the package of Egg Noodles. I noticed that some noodles had a cook time of 10-12 minutes and others had a cook time of 8-10 minutes. For pressure cooking and for this recipe, that is a substantial difference. I chose the longer cooking noodle, even though they noodles were smaller than the larger size noodles. You might say, well then, just reduce the cook time. In other recipes, that would work, but not here as to reduce by 2 minutes, would be to not cook at all. I’m not a casserole type of person, but I have always loved my own recipe. Many, many years ago, my friend Adrienne Bingham was over my house and made a Tuna Noodle Casserole. When I lived in Tarzana, we cooked together a lot on weekends. It was so good and I have been making her version of the recipe, ever since. As you can see, I added more peas after the fact, as I like the snap of the peas. It only takes a few seconds for them to defrost and warm. There you have it. Probably more than you ever wanted to know about this darn recipe. Tuna Noodle Casserole is not pretty, no matter how it is served, so I used lots of floral stuff to try to make the food pretty. Hehehe. So, back in the 50’s and 60’s when casseroles were very popular as they were basically throw in a bunch of ingredients and pop it in the oven, they were not generally served at dinner parties. I’m wondering if it had to do with canned soup too. My Pressure Cooker Tuna Noodle Casserole doesn’t use canned soups, so, invite some friends over and serve it at your next dinner party. Come on, try it….well, at least invite the neighborhood kids over and enjoy a nice family dinner with their friends. 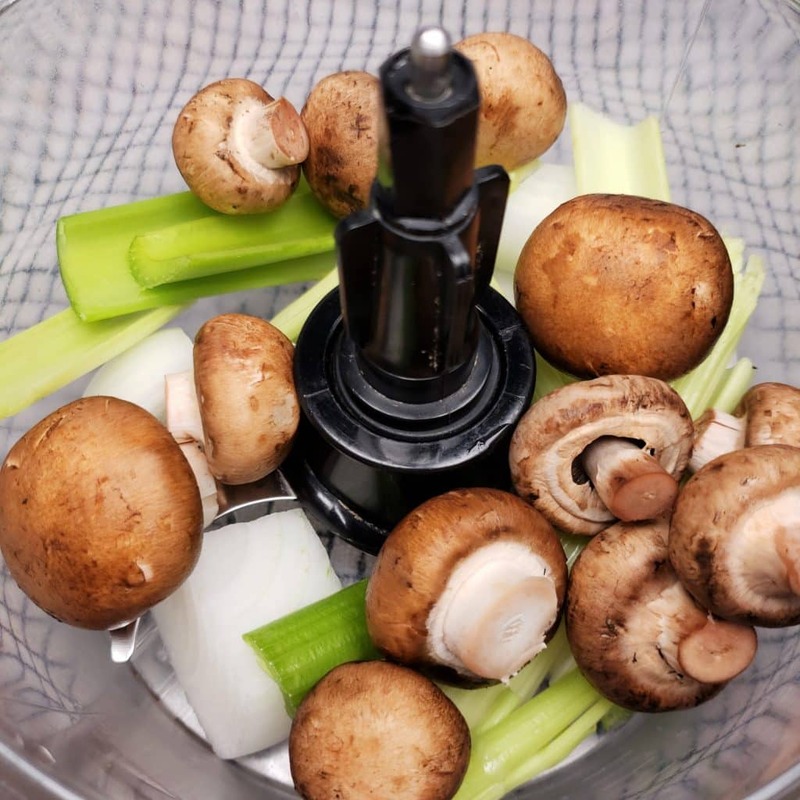 Add celery, onions and mushrooms to food processor and process until small pieces (like minced). 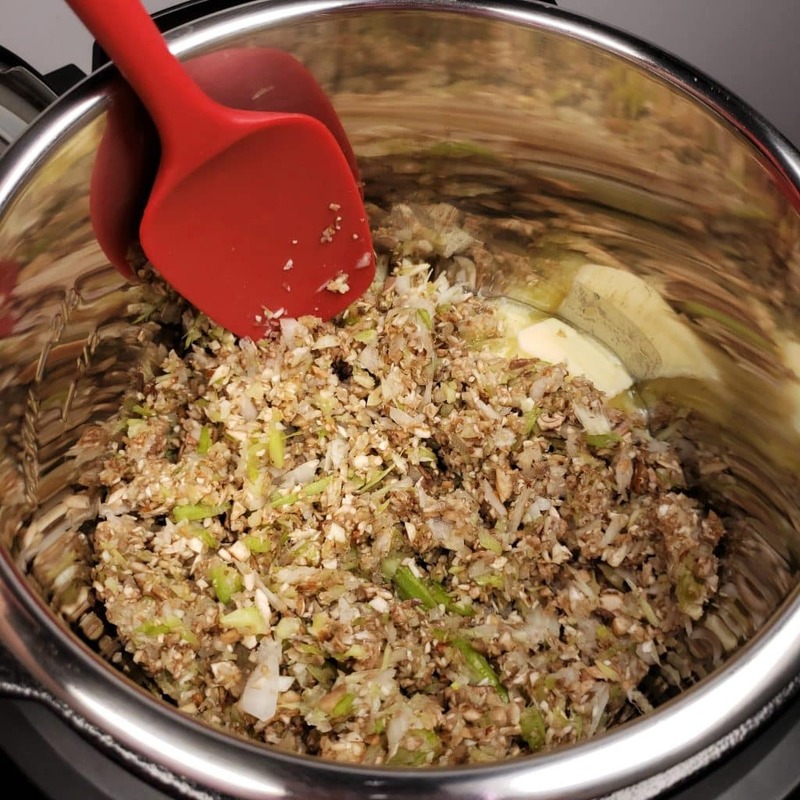 Add butter, the minced celery, onions and mushrooms to cooking pot and let sweat/sauté for 5 minutes. Add potato starch, salt and pepper and mix through veggies for about 30 seconds, or until starch is fully incorporated. Add sherry and deglaze pot. Pour in cream and simmer about 5 minutes, or until thick. 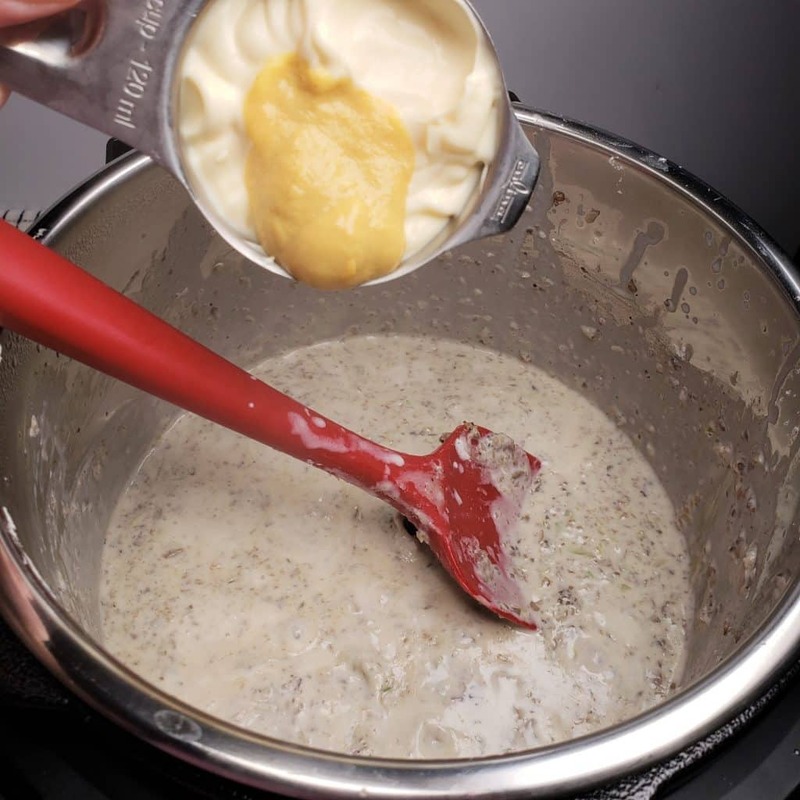 Whisk in mayonnaise, Dijon mustard, Worcestershire sauce and chicken broth. Taste and adjust salt and pepper, if needed. It should be a bit slightly over seasoned. 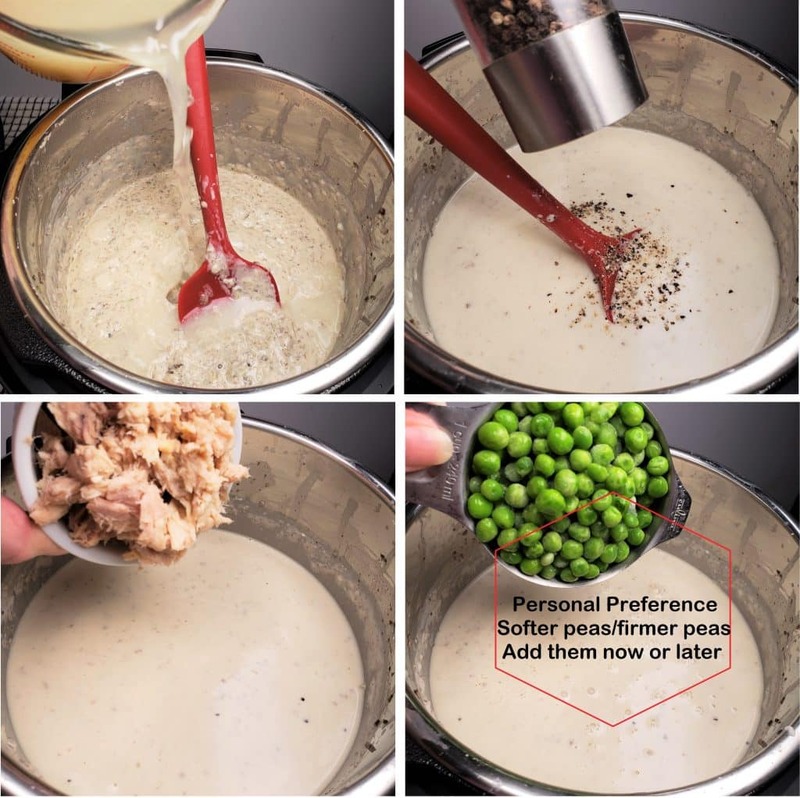 Mix in tuna and peas (now or later) and dump in noodles. Lock on lid and close pressure valve. Cook at high pressure for 1 minute. When beep sounds, wait 2 minutes, then carefully release the rest of the pressure. Remove lid and mix in frozen peas (if they were not added earlier). How important are the mushrooms? I’m not a fan of them. In your Tuna Casserole recipe, do you really only Pressure cook it for 1 minute? Did you precook your noodles? 1 minute doesn’t seem long enough. Jill, this looks great, would not change a thing, but would add crushed potatoes chips on the top, just how we always had it growing up. I love tuna noodle casserole, but no longer make it as I cannot have (cow) dairy or wheat. I can sub a non-dairy version for the butter. Wondering if this might work with a milk substitute or full-fat coconut milk. Also wondering if GF noodles would work if they adhere to the 10-12 minute minimum cooking time. Your thoughts? Thank you. This is really, really delicious! So creamy and tangy, I love it! This is absolutely delicious. Thank you for the recipe for not using canned soup. Your method works so easily that I will be using it for other recipes that call for canned cream soup. I always found that there was an odd taste to canned soups that alway stuck around even after cooking. This solves that plus I can control the sodium level. Which is always a good thing. I always seem to get burn warnings when I make dishes like this in my 8qt instant pot. Should I be adding more liquid to dishes to avoid this? I made this today with no issues following your handy steps until I set the pot for the 1 minute. After 5 minutes of building pressure, I got the dreaded burn notice, added more broth to deglaze a second time, added another cup of broth and then tried again.. and again got burn. Anyways, we scraped out what we could and the salvaged portion was actually quite delicious and I could imagine how wonderful it would be without that issue. I’ve read about other people having the burn issue a lot more frequently with their 8qt and I have to say it’s happened several times for me as well. This is the first time I’ve ever had this from one of your recipes, and based on how well it still tasted, I’m guessing there may be something to that theory of the 8qt being hotter. Thanks for all of the tips, I will make sure to do a follow up the next time I make this wonderful dish! Once again Jill, your recipe is spot on. This was delicious! So glad I’m not having to dump in a high sodium filled can of goop to make a tuna noodle casserole. Thanks! When I first read the ingredients list, I thought adding Dijon mustard sounded super sketchy, but was willing to try since I loved not having to use Cream of Chemical soup. I substituted cornstarch for potato starch because it’s what I had on hand, and doubled everything else because I was making this in my 8qt and wanted leftovers. I, like others, got the dreaded burn notice. I’ve had this happen with a couple other dishes, and since my patience was wearing out (long day) I simply scraped everything into a glass casserole dish, shoved some chunks of Monterrey Jack cheese into the middle and edges, and nuked it for two minutes. A couple rounds of nuke/stir, nuke/stir later, everything was melty and wonderful. This recipe is DELICIOUS. Adding the cheese was the crowning jewel, but I am confident that without the cheese it would still be amazing. Thank you for creating a wonderful, unique take on a classic!! PS – Not sure if I’ll use my IP for this recipe again, but if I do I will do the pot-in-pot method. Hands down the best I’ve ever had. Period. I made the recipe in my 6 at. IP and used full fat coconut milk instead of heavy cream and soy free/dairy free butter. Other than that, I followed your recipe to a ‘T’. While I fully deglazed the pot I did get the dreaded ‘Burn’ and could not get past it. My workaround was to grab my extra inner pot, put water and the trivet in the bottom, then dumped the mixture into a pressure-proof bowl, placed it on the trivet, then re-cooked at high pressure for 1 min. It came out delish!! 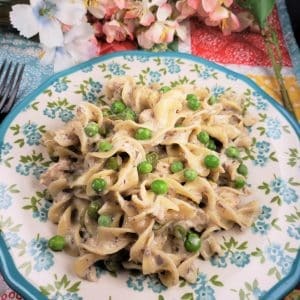 I definitely prefer adding the peas after cooking has completed so they stay a brilliant green and ad that extra pop of flavor and tender crisp texture. Thanks for sharing such a wonderful way to make an old family favorite comfort food. This was so good! I am over the moon happy to find a tuna casserole dish with “no canned-soup” and for the IP. This is a keeper. Thank you!